At long last, a shake-up at the top of the national rankings as evidenced by the new D-I poll released on Monday. After knocking on the door the past several weeks, including the gaining of more first-place votes than Minnesota two weeks ago, St. Cloud State ascended to the #1 spot. The Huskies -- whose first-place output increased from eight votes to 33 -- kept their unbeaten string going over the weekend with a sweep at Minnesota-Duluth by scores of 4-2 and 5-1. It's a milestone for the program, which hasn't ascended to the top spot in the country since January 7, 2002 and reached the pinnacle for just the seventh time in school history. The Golden Gophers slipped down to the No. 2 spot thanks to a 2-2 tie and 3-2 win at Big Ten rival Michigan State. Michigan remained firm at #3 after a 5-4 victory over Ohio State on Monday, while Ferris State climbed two spots up to No. 4 -- with wins of 5-3 and 3-1 at Lake Superior State -- supplanting Providence, which clock in at #5 after a 3-3 tie against Hockey East rival and new No. 16 Northeastern at historic Matthews Arena. Boston College re-asserted itself over the weekend, climbing three spots to #6 after a weekend home-and-home sweep of New Hampshire. The Eagles won 6-2 on Friday at Conte Forum, then took a 2-1 decision at the Whittemore Center which shipped the Wildcats out of the rankings after they were placed 18th. Quinnipiac lost at new No. 10 Union and tied RPI to fall into seventh place, Clarkson moved up two spaces to #8 after sweeping St. Lawrence 5-4 and 4-3, UMass-Lowell sunk two slots to No. 9 with a 6-1 win over American International followed by a 4-2 loss at Maine. Defending champions Yale tumbled three places down to #11 thanks to a pair of Ivy League opponents, losing to Dartmouth and tying Harvard both in New Haven. The Penn State Nittany Lions faced their first true tests of the season last weekend, with their Big Ten openers at #15 Wisconsin, and came up short in both. Their losing streak reached six games after dropping decisions of 7-1 and 4-3 at Kohl Center, leaving the club at 3-9-1 heading into a 20-game break before the Three Rivers Classic. On Friday, Tommy Olczyk netted his team's lone goal, but a 43-shot attack which included scores from seven different players staked the Badgers to victory. Matt Skoff was left in for five of the seven tallies, with P.J. Musico finishing the contest. Joseph LaBate led all scorers with three assists. The next night, Nic Kerdiles potted the winning goal with 8:08 left in regulation, just over four minutes after Zach Saar tied the game for PSU. Eric Scheid picked up the game's first goal on a power play at 6:39, then Wisconsin struck back with two goals before Ricky DeRosa tied things with 7:51 left in the second. Saar and DeRosa both notched a goal and assist to lead the visitors in defeat. Following the semester and holiday break, Penn State heads to Pittsburgh for games on December 27-28. The opener of the tourney comes against Robert Morris, and depending on the result, the closer will come against either Boston College or Bowling Green one day later. Princeton comtinued its early-season slide, by dropping both of its ECAC road games, to Union College and RPI. On Friday, Shayne Gostisbehere put a game-high six shots on net and was a plus-2 as the Dutchmen blanked the Tigers by a 3-0 count. Colton Phinney finished one shy of a career high with 31 saves but it wasn't enough for the visitors. One night later at Houston Field House, two goals 23 seconds apart early in the first period sealed the win for the Engineers. Chris Bradley and Brock Higgs beat Phinney in a three-goal first period for the hosts. Alec Rush and Jonathan Liau managed to beat Scott Diebold but Andrew Ammon was held off the scoreboard once again. Now 3-12-0, the Tigers have three weeks to sit and stew and figure out how to break the funk, before going to the Gulf Coast for the Florida Hockey Classic. The two-day event opens up with a contest against Maine on December 28, then one day later depending on results, it will be a matchup with either New Hampshire or Cornell. 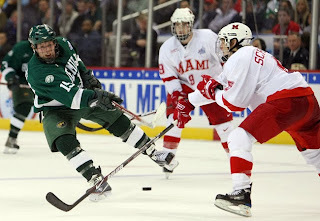 Check out this commentary on future Frozen Four sites from Jimmy Connolly. The announcements will be made official on Wednesday. With the exception of his complete ignorance of Philadelphia, it's a solid thought process, based on the fact that the NCAA is going for the big arenas in major cities. He also hits the nail on the head with the cities that should be hosting.